We spent a wonderful week in early September at Olive House. It is located on the heights of Aliki in the south of Paros and offers a splendid and clear view of the sea. The house is well oriented, offers several shaded and sunny terraces, and it is bigger than the photos appear. The communication with the owner and the person managing the rental on site was excellent. The decor is very tasteful. Well-equipped kitchen, barbecue on the terrace, comfortable bedding. Many delicate touches on arrival: water reserves for the water fountain, fruit, cheese bread, etc. Shops and restaurants are a 5-minute drive away. We would definitely go back! We have never loved a holiday home as much as your Olive House. We are very thankful that we were your guests. We were so happy with the terrace with the beautiful view by day and the starry sky at night. Ramona is a treasure: she welcomed us very muc h. We will be glad to return. Thank you for sharing your beautiful home on Paros! Our vacation was wonderful and your home is not only beautiful but so inviting and comfortable. A special oasis, inside and out! We can't wait to return!!! Great space feeling, beautiful views, nice areas to relax, friendly and prosperous environment. We truly recommend this property to everyone who wants to escape. Paros is the perfect island and this property is gorgeous. My fiance and I loved your beautiful home! 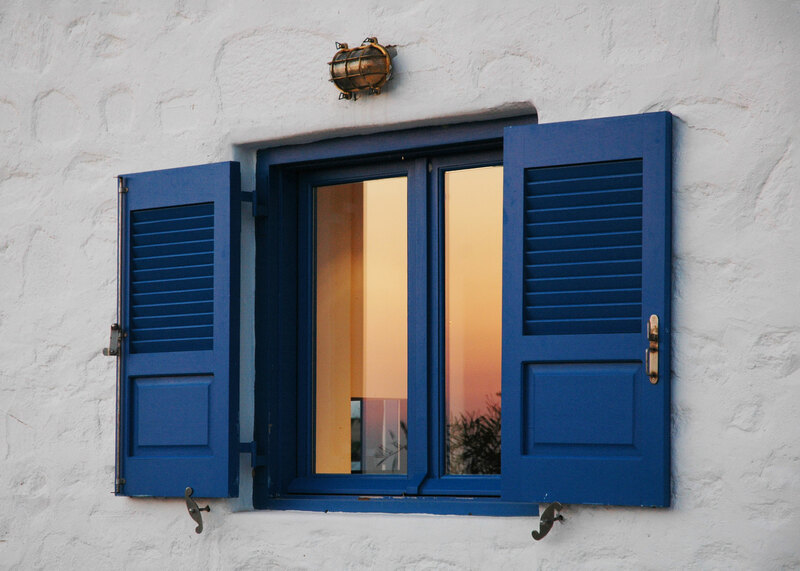 Thank you for making us feel so welcome, and giving us tips on all the best things to do in Paros. We look forward to coming again soon! Maybe for our honeymoon! The Olive House was perfect for our family get-away. We couldn't have been happier with the relaxed, open-plan feel, and all of the modern, convenient touches. We loved our local beach, and you hosted us marvelously! Thank you! We stayed a week at the Olive House with friends and our 1.5 year old daughter. The concierge picked us up and gave us an overview of the island, and recommendations on sights and restaurants. She was also available anytime during the week for questions or recommendations. When we stepped into the Olive House, everyone was wowed by this beautiful home, the amazing views. The house was fully equipped for cooking, BBQing and morning coffee/espresso. We enjoyed beautiful sunset dinners on the veranda, made with freshly picked rosemary from the property, homemade olive oil, and pomegranate from the backyard. Wherever there's a beautiful view, there's a comfy chair to sit and take it all in. Every morning we woke up to a gorgeous sight of the the open sea and Antiparos. My daughter loved exploring the house and discovering toys and books. My favorite activity was a relaxing soak in the master tub. The house is perfect for a romantic getaway, a trip with friends, or families with young children. Would highly recommend! I can't say anymore about Olive House than what others have said already except that it's all true! The best part for us and our family was the welcoming feeling of the house itself (and that was after Ramona took such good care to get us settled in). For a family with young children (we had 12 and 10 year old grandchildren), you couldn't ask for more. Kate, you thought of everything. The kids loved being in the house as well as playing on the vast and numerous patios off every room! We were so comfortable! The website photos, as gorgeous as they are, don't do it justice. The Olive House is awesome! Thanks for everything! Our family spent a lovely, blissful week at the Olive House. The house is beautiful and extremely comfortable, with peaceful gardens, picturesque patios, and a perfect master bedroom with a view across the Aegean Sea to the island of Antiparos. It is located on a hillside near the small town of Alyki, a quaint waterside village with good casual dining spots. The local bakery provided fantastic baked goods for breakfast. We were met at the ferry by Ramona, who helped us find our rental car, led us to the house, gave us lots of good advice about sights and activities, and was available during the week to answer any questions. Having Ramona available to us felt like having a local friend on the island. Each day we visited a different beautiful beach to swim in the sparkling water. Our favorite town was Naoussa - all white-washed walls and blue shutters. A goofy pleasure popular with our kids was the small water park near Naoussa. The water park was all salt water, with slides that dumped you right into the sea. We also enjoyed taking our car on the ferry to Antiparos and exploring that island, including some surprising caverns. We loved our time at the Olive House and most definitely recommend it for a fun and relaxing vacation. Paros – what a surprise! Everything is beautiful - the sea, the villages, the hills, the views, and especially…every day coming back to the Olive House. Everything was perfect! Thank you. We had a wonderful time at the Olive House. The view and the location of the house are perfect. Everything is done with very good taste. Very nearby the house there are beautiful, different places to go for a swim. This part of the island is one of the best, because it is still wild and not too crowded. For children, the house is perfect, and the garden is very peaceful. We hope to come back one day. Thank you. When my fiancé and I decided to get married on the island of Paros, we realized we'd need some nice places for family to stay. We love the small town of Alyki, in the southeastern part of the island and wanted to find rental property near there. We were in luck to find Olive and Stone and their two homes for rent near Alyki. We rented the Olive House up on the hill behind Alyki for my parents and my brother's family. It was magnificent. Large and beautifully equipped, the home has a very large terrace with spectacular views of the countryside and sea. We had a gathering for arriving family and friends there one night, as the sun was setting. We put on Greek music and practiced Greek dancing on the terrace until it was too dark to see! This home is perfect for a large family. It is modern and like a Californian villa with lovely landscaping and decor. It is up a steep and unpaved road, exciting to navigate, and the view and accommodations were worth the climb! A family of seven, spanning three generations, we set out to Paros for a holiday. Our destination was The Olive House. Little did we realize how much our experience would be shaped by the home we stepped into. Being met at the boat by the concierge was the beginning of our journey. We were guided to our destination and all our questions were answered. The food and drink that was supplied as well as the beautiful flowers from the gardens helped us to feel welcomed as we crossed the threshold into the beauty and comfort that surrounded us. To sit on the patio and gaze out at the Aegean Sea, cook in the festive kitchen, and eat our dinners outside by candle and moon light helped us to feel fully in this place. Our 2-year-old grandson was always engaged as he played in this child-friendly environment. There was never a rush to head out in the mornings as we were content to just be in this well tended home. Short trips to the nearby bakery for freshly baked morning fare would suffice. What a joy to have had this opportunity and I have to say that the owners were more than helpful at every turn of the way. I am so appreciative to have discovered The Olive House and would recommend it without hesitation as a place to fully experience Paros. Thank you for your beautiful home – one of the most peaceful, well laid out, well thought out homes I have ever been to. Also, it was so wonderful for my son, who could roam to his heart's delight and make discoveries, like the chickens and an incredible praying mantis-like bug! Finally, thank you for a perfect spot to work on my art history dissertation. I will always have thoughts due to your house! Loved every fabulous moment here. We had never been to the island of Paros before, so we didn't know what to expect. One of the most pleasant surprises we did find on Paros was the Olive House. Beautifully situated on a quiet hillside looking directly at Antiparos and the gorgeous blue waters in between. 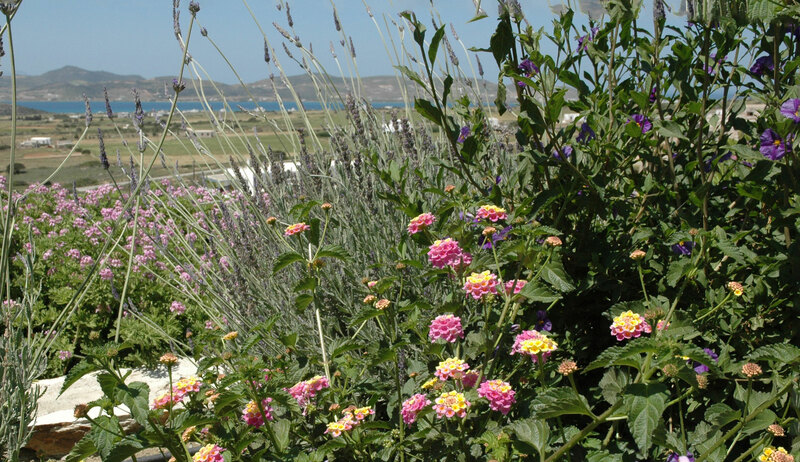 Immaculate gardens, vineyard, olive tree grove and the most pleasant scents all day long. 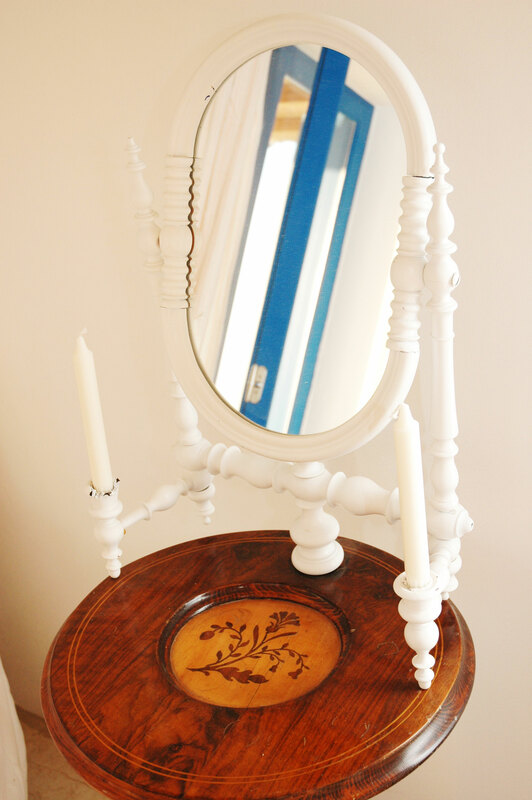 Beautiful rooms and furnishings. And above all, oh so quiet! The Olive House is perfectly located to easily access any place on Paros, and a super quick 5 minute ferry ride to Antiparos. Perhaps most importantly, the Olive House is a quick two minutes to a local bakery that seems to stay open forever and turns out the most amazing goods imaginable! Don't let the hustle and bustle of Athens wear you down. Once you reach the Olive House, be prepared to completely check out, slow down, and enjoy an amazing house on an amazing island. Thank you for sharing your beautiful, comfortable home with us. We had a fabulous time – exploring the island, hiking, enjoying all of the wildflowers…Great food, experience & views. We will miss it all. Incredible!! We truly enjoyed your magnificent island paradise. Your home is so beautiful, warm, and welcoming. Thank you for all of the wonderful goodies, and great information about the island. We all had a relaxing and inspirational trip. Soon after leaving the high-spirited bustle of Parikia, it becomes clear that the Greek island of Paros is a world apart and that The Olive House sits comfortably atop that world. While the kids play in their room, on the quiet hillside or the massive patio, one (or two) may choose to plot explorations while enjoying a glass of Parean wine in the deep bathtub, gazing across the carefully-nurtured orchard to the sea. You'll need a car, plenty of time, some sunscreen, and little else. We have been more than once, and will surely go back. The Olive House exudes a feeling of peace. Come to stay and you will quickly adapt to the pace of island life -- mid-day swims in the Aegean, trips to town to buy fish straight off the boat, evening sunsets over the wide stone veranda. The house is comfortable and well cared for and you will be too. The Olive House is all about comfort and pleasure, in one of the most beautiful settings imaginable. Living and relaxing spaces abound inside and out, and as a guest you find yourself weaving them together in the course of the day: into the fragrant garden in the morning, and onto the west-facing veranda for dining in the evening. Our favorite day trips are to Lefkes, and to Antiparos. There are fun, casual eateries along the beach in Alyki. On the road from the House to Alyki you'll want to find the local bakery; it could become a daily before-breakfast habit. Enjoy. I will always remember Paros and the Olive House for their exquisite aromas: lavender, lemon verbena, and mountain sage wafted through the air whenever the breeze brushed the garden. I felt like a queen, strolling your broad verandas, watching the sun set over the little island with the white chapel off in the distance. Thank you, thank you for an absolutely wonderful vacation!